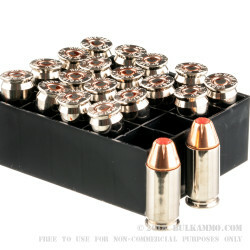 Before special tactics units within law enforcement expect their officers to go above and beyond the call of duty by putting their lives in harm's way in defense of their country, they are armed and equipped with some of the best ammunition on the market today. 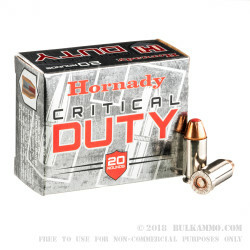 The Hornady Critical Duty 220 grain .45 ACP +P Jacketed Hollow Point is one such round, and is guaranteed to outperform in even the most demanding of situations. 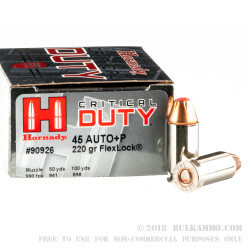 Designed and engineered to outperform, the Hornady Critical Duty 220gr .45 ACP +P JHP utilizes Hornady’s patetend Flexlock bullet technology to deliver a truly barrier blind round that excels during combat in any urban environment. Engineered to pass through peripheral barriers such as glass and drywall without prematurely expanding and degrading the bullet terminal performance, Hornady Flexlock bullets are the most coveted rounds in law enforcement circles today. 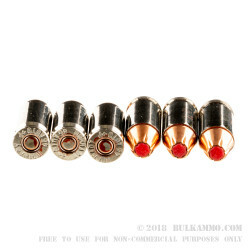 High visibility nickel plated brass cartridges make for easy press checks in low light environments, and provide for a smooth feeding and extraction of subsequent rounds without malfunctions during even the heaviest courses of fire. Precision measured low flash propellants burn hot without obscuring your night vision, and at an average muzzle velocity of 975 feet per second, this is on of the most devastating .45 ACP +P to ever come into existence. For law enforcement officers willing to spare not cost in the pursuit of performance, the Hornady Critical Duty 220gr .45 ACP +P JHP is your one and final solution.